From desolate, open and wild to hectic, buzzing and bright, we've made our way from Mongolia into China. Along our journey, we were told by multiple locals and other travellers that China was plain crazy. With two weeks to immerse ourselves in the culture and lifestyle, I now understand what they've meant. China is somewhere hard to explain in a few short words and a place you truly have to go to learn what I mean. One moment your in chaotic streets surrounded by flashy lights, honking cars, manicured parks, visible wealth, and endless people and a moment later you can be riding through open country where agriculture rules, garbage is littered everywhere, poverty alleviation programs are in place, and the pace of life slows down for a moment. If it's not the lifestyle, its the difference of riding through life-shortening black smog passing massive power plants, to riding alongside thousands of windmills and mountains draped with solar energy panels. On top of this, China's history, culture, wonderful art and temples, religious practices and beautiful architecture has truly shaped a wacky, wonderful, contrasting country we soon came to learn from and admire. China is also a place that seems to do things on a very grand scale. All of the cities and even some of the smaller towns would host monstrous statues, professional sports stadiums, ornate temples and art, streets that lit up like Vegas and impressive, yet utterly ridiculous high-rise buildings. I'm sure the locals got a kick out of two foreigners on bicycles looking absolutely perplexed by the lights, people, shops and endless choices (what do you mean there is more to eat then just pasta!?). Our first day coming into China was probably one of the craziest experiences of our journey. With the Mongolia-China border refusing foot passengers (or cyclists) to cross, there were hundreds of taxi drivers determined to be the one to take you across. We biked as far as the border control officers would let us and sure enough, once we were stopped five drivers were eagerly shoving pass each other to take us. Loading our bikes into an old, battered and barely running jeep, we jumped into the back ready to go. It only seemed fitting that of all the men who could have picked us up, it happened to be the one whose battery died half way through the crossing. Jammed between hundreds of other vehicles, honking, yelling and cutting each other off, our driver hopped in and out trying to restart the battery. With no luck, he waved down another driver to tow us through. Once we got out and went through the Mongolian immigration offices, we continued driving towards the Chinese border control. This is where the real mayhem began. The next section of the border included a quarantine station, where the hundreds of jeeps had to funnel into one single lane. The already aggressive drivers became entirely unhinged. Yelling, honking, bumper to bumper, being hit from behind, we couldn't believe the hysteria. Passing through the quarantined zone, we had a few hundred metres to reach the Chinese border control. What we thought had already been a manic experience turned into complete anarchy. It became quite apparent why our drivers jeep, along with the others were barely holding together. The next twenty minutes became a savage fight of side swiping, drivers hard on the gas pulverizing the cars in front of them, horrendous whip lash and a true reality of full on bumper cars. While Brandon and I looked out in complete horror, our driver howled with laughter as his jeep was getting smashed to bits. For him, this was just another day at work and watching two foreigners so taken back was apparently quite comical. Seeing our own drivers reaction, we couldn't help but burst out laughing and 'enjoy the ride'. After over three hours passing through the three kilometre border crossing we entered into the Chinese town of Erenhot. We stayed at a little hostel where we enjoyed the company of our friendly host Nelson. Born in China and with a decent level of English, we graciously accepted his offer to show us around town, have dinner together, and above all else gain a deeper insight and understanding of China. Leaving the next morning we intended to cover a large distance in the days that followed. Cycling 110-130 kilometres for four consecutive days left our bodies sore, muscles tight and minds drained. On our first day of riding from Erenhot, we rode through the last section of the Gobi desert. As the day continued and the winds picked up, we were immersed in a full on sand storm with harsh winds of over 50km/hour, low visibility and sand blowing in every direction. I felt nervous in the eerie atmosphere, suffocating from the heavy clouds of dust while having another 60 kilometres of riding ahead of us. As the day passed, declining offers to get picked up, we rode into a small town and checked into a cheap hostel for the night. The days that followed brought about a drastic shift from country roads in the grasslands to crazy, urban city centres. 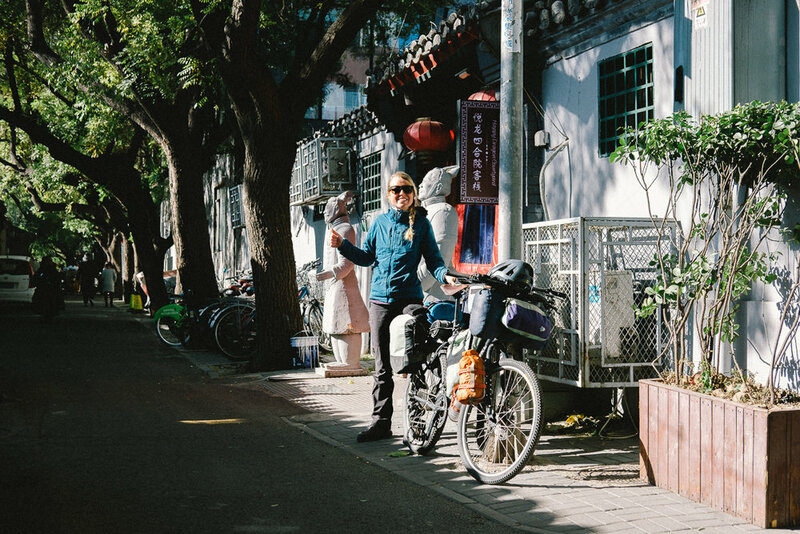 We knew coming into China our days of wild camping and dirt roads were behind us but cycling into Zhangjiakou, a city of 4.5 million, this became even more apparent. After taking a day to rest and visiting an old entrance to the Great Wall, we continued along the road to Beijing. Unfortunately, the last section of our journey to Beijing was probably some of our worst riding. We cycled along a secondary highway passing nuclear power plants, through smog that left our eyes watering, by massive industrial parks and all while in the thick of traffic full of semis and work trucks. These couple days of riding did, however, allow me to reflect on the fact that we were truly making it to the end on our own. Even when the desire to seek out alternative forms of travel was so strong and available, we continued to ride. Ultimately, we persevered and stuck to our ambitious idea of traveling to the end completely by bicycle (minus the border crossing). While I could feel negatively towards this section of riding, I am instead grateful to have used it as a reminder of our resiliency to the end. 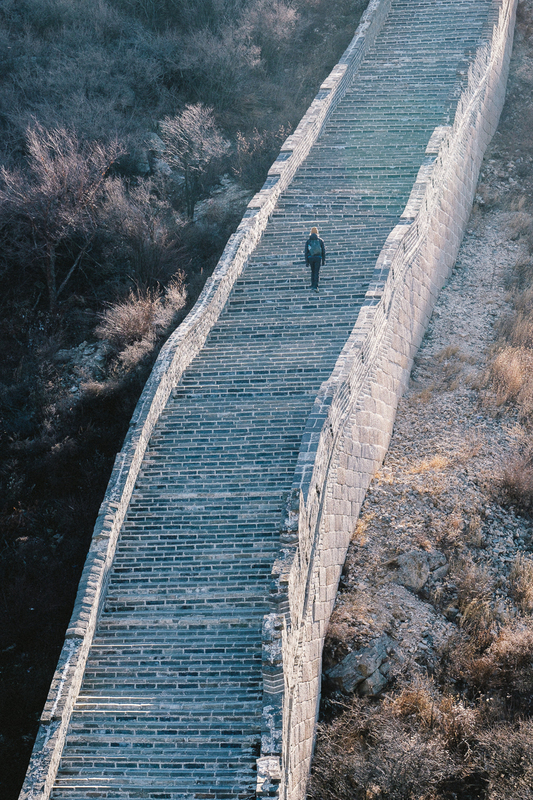 Inching closer to Beijing, we stopped at the ancient walled fortress of Jiming to wander the old streets, walk along the wall and enjoying a cozy homestay. We also visited the ancient Ba Da Ling Great Wall area for the day. We were completely blow away by the magnificence of both the wall and its rich history. Ba Da Ling is one of the most visited sections of the wall, so we were happy to come across the older section across the valley, away from the various tourist shops, restaurants and bars, and thousands of other travellers. Walking along the wall, through the hills and valley, entirely by ourselves was an absolutely phenomenal experience. After Ba Da Ling, we set out on our final day of riding. Over 70 kilometres from the city centre it already felt as if we were in Beijing as the outer lying communities, buildings, and people had overcome the region. At this point, we were happy to utilize bike paths for the remaining 50 kilometres. However, these separate bike lanes were nearly as hectic as the highway, with the high volume of rickshaws, scooters and cyclists using them. It made for a completely crazy, yet invigorating and amusing final ride. I'd like to say we concluded with some great celebration of riding entirely from Calgary - Beijing, however coming up into the centre and reaching the end of our ride just kind of happened. We didn't know what hitting the end would feel like. Would we be overcome with intense emotion? Would I cry or get teary eyed? What would be running through our minds? But when we reached the end we just smiled, put our bikes down, gave each other a hug, sat for a moment and went to grab lunch. Riding over 10 500 kilometres through Canada, Alaska, Eastern Russia, Mongolia and China in the last seven months, it seems impossible to reflect on the entire journey in one single moment at the end. All I can say now is how completely overcome with gratitude I am for this entire experience. The beautiful places we encountered, the understanding of new cultures, the phenomenal people who touched our lives forever, the incredible struggles that turned into the greatest lessons, a growing passion for meditation and writing, and a deeper love and understanding for the magnificent world we live in. I know that the days and months that follow will allow for more personal reflection and insight from this remarkable adventure. Once we reached Beijing, we spent a week to relax, touring around and seeing all of the different sites. This city is truly fascinating with all of the ancient temples, crazy hutongs (narrow alleyways) offering spectacular hidden shops and cafes, beautiful parks and endless sites to see. 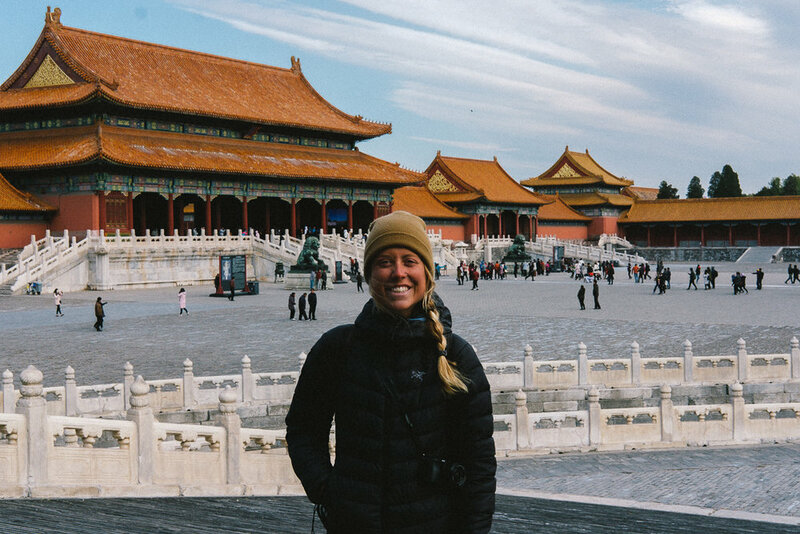 We visited the impressive Forbidden Palace, Tiananmen Square and the beautiful, yet completely overcrowded Lama Temple. We also did not want to pass up the opportunity to seeing a traditional Beijing Peking Opera show. If you have never heard of this kind of performance, I highly suggest you check out some videos on Youtube. The costumes, make up, singing, dancing and acrobatics were beyond anything we had ever witnessed before. While in Beijing, we were also on a continual hunt for the best microbreweries and vegetarian/vegan cafes. The city is home to some pretty unreal, tucked away little bars and cafes along the seemingly empty hutongs. I'm pretty sure I also made Brandon stop at every single fruit and vegetable stand, and trust me, there were a lot. We also enjoyed the remarkable 798 Art District while being off our bikes for the first time in months. From months of cycling day after day, it has felt very weird not to be be on the bikes, seeing other travellers, walking the city streets, being in such a large urban area and boxing up our bikes. The change is drastic and one that has taken some adjusting. However, as we fly to Sapporo and begin settling into our new home in Kutchan, Japan we are incredibly excited for a change and chance to meet new people, work for a while, and snowboard in some of the best powder imaginable. As we close this chapter of our journey and look ahead to new adventures, opportunities and experiences, we truly cannot express our gratitude and thanks to everyone for the continued support and encouragement we have received along the way. It means more to us then you will ever know!